Br Mateusz and I had a leisurely breakfast of scrambled eggs this morning after Mass. Tomorrow onwards the school starts and back to regular schedule. This reminded me of the first time that I ever made or cooked anything at all in my life! It was while at Deolali in Nashik on one of our Sunday ministry days back in 1999 that Mahesh and I found ourselves really hungry by noon. Having attended the Mass, done with the Catechism for the children, the youth animation with the youngsters, choir practice for the next Sunday and our usual chit-chat with the youth, we were exhausted and starving. As soon as the last youngster left the Church premise we rushed to the presbytery to have our usual late breakfast. Unfortunately that day the Parish priest was away and so was the cook. To our dismay there was nothing in the dining hall. Imagine our horror when we realised that there was nothing in the kitchen either - nothing means, not just any cooked food, not even anything to eat! And those were the days when there was no shop or any eatery around the Church - it being in the military compound. And if there were, we wouldn't have bought anything for our budget was strictly travelfare! After a quick search of the whole kitchen all that we found was eggs. We decided to make omelettes. After all, we said to one another, it is just breaking the eggs and putting them on the frying pan. But we couldn't even find the cooking oil - it was all locked up in the pantry. Even in those 'hungry' moments, we hit upon the idea of using the little oil in the small pickle containers on the table. That's how we made omelettes - with oil from the pickle jars! 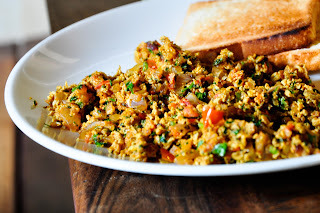 Of course, the latest memory of scrambled eggs is the breakfast I had at Cheryl's place in Bangalore and she telling me "You'll remember this scrambled eggs when you see the way it is prepared in UK!" I do! !